My experience, after having cooked for my family, and after having worked in a kitchen, for years and years (decades really), is this: people love fries. Love ’em. These Baked Parmesan Encrusted Zucchini Sticks are not fries. But they look like fries. And as such, people will reach for them. So, sit back and enjoy the look on people’s faces when they realize they just ate accidentally something… healthy! Thankfully, these Baked Parmesan Encrusted Zucchini Sticks are delicious too. The first thing that needs to be done is to cut up your zucchini. I will usually cut my zucchini into 3 x 1/2-inch sticks, but actually, the size doesn’t matter so much, as long as they are all the same size. This is so that all the zucchini sticks cook at the same rate. In the first plate, whisk together the flour and garlic powder. In the second plate, beat the eggs with the milk. In the third plate, combine bread crumbs, cheese, parsley, oregano, salt, and pepper. Then it is just a matter of dredging each zucchini stick in the flour, dipping them in the egg mixture, and coating them with the bread crumb mixture. If you prefer, you can substitute the breadcrumbs with panko. Place your coated zucchini sticks on a parchment lined baking sheet and bake in a pre-heated oven. 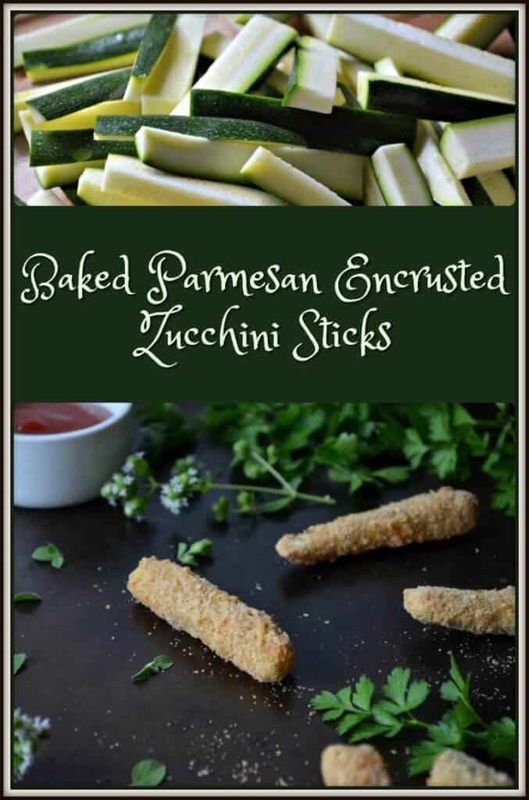 While they are baking, why not make a dipping sauce to serve with these Baked Parmesan Encrusted Zucchini Sticks? A favourite in my household is a Simple Marinara Sauce. And there you have it, a great zucchini recipe to have as a side or an appetizer! As far as the nutritional value of zucchini is concerned, it truly is a powerhouse. It’s a great source of Vitamin A, C, and the B complex vitamins; it is high in fiber and low in calories. You truly cannot go wrong with this vegetable. Just like these Lemon Ricotta Cheese Cookies, I found the inspiration for this recipe on Pinterest. One of the pins I stumbled upon brought me to one of my favorite sites: Jo Cooks. Joanna uses panko breadcrumbs, parmesan cheese and eggs to coat the zucchini sticks before they get baked. I decided to use a combination of flour, egg, breadcrumbs and lots of herbs, which was one of my mom’s favorite flavor combination to use with vegetables. Are you still dealing with zucchini? This healthy recipe for Baked Parmesan Encrusted Zucchini Sticks tastes so good - you won't believe they are not fries. 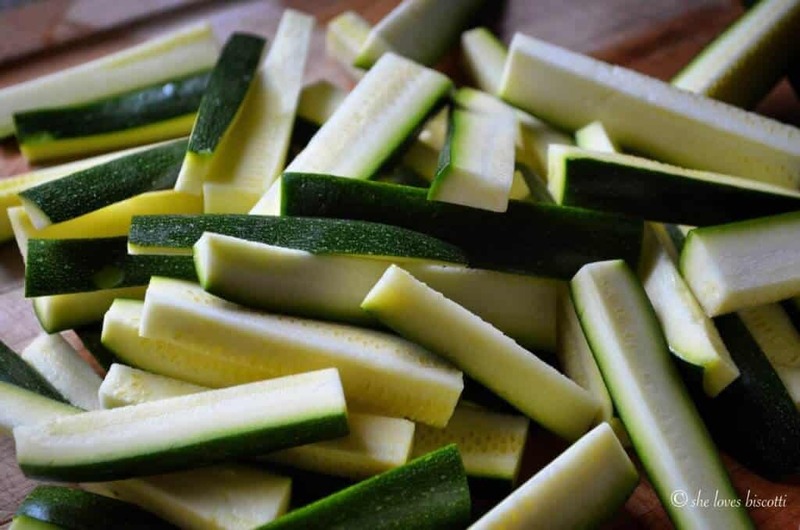 Cut zucchini into 3 x 1/2-inch sticks. Prepare 3 shallow plates or bowls. In the third plate, combine bread crumbs, cheese, parsley, oregano and salt and pepper. Coat each zucchini stick with flour, followed by a dip in the egg wash and finally rolled lightly in the bread crumb mixture. Place each zucchini stick on the parchment lined baking sheet. Continue this process for all of the zucchini sticks. Bake at 425℉ for about 25-30 minutes. Turn them over after 15 minutes. Remove from oven and serve with your favorite sauce. Beautiful photos. I loved zucchini sticks as a kid and when we’d go out to eat, these were my appetizer of choice. Weirdly, I’ve maybe made them once in my adult life. I get tunnel vision with my abundance of zucchini: muffins or bust. But I’m going to bookmark this and make a point of making them, if not to get out of my muffin rut then to relive some of my favourite childhood foods. Yum and then yum! We love our zucchini sticks around here, but we usually deep fry them, because we also love our “fried food”. From now on we’re going to bake our zucchini sticks, that’s it. They look amazing, they’re healthier and I love that crust! Plus, the marinara sauce 😉 . So easy, and such a healthy snack, both for adults and kids! I never get tired of zucchini and I continue to buy it even it’s finished in my garden. Great post!